GROUNDHOG DAY IS COMING AND PREMIER INSPECTIONS WOULD LIKE TO GIVE YOU A FREE SPRINKLER INSPECTION WHEN YOU SCHEDULE A GENERAL HOME INSPECTION! SO CALL TODAY AND SCHEDULE YOUR HOME INSPECTION 817-637-6837!!! 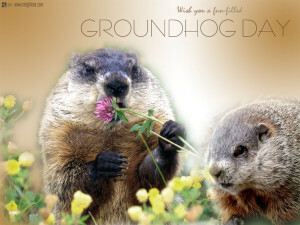 Groundhog Day is a traditional holiday celebrated on February 2. According to folklore, if it is cloudy when a groundhog emerges from its burrow on this day, then spring will come early; if it is sunny, the groundhog will supposedly see its shadow and retreat back into its burrow, and the winter weather will persist for six more weeks. Modern customs of the holiday involve celebrations where early morning festivals are held to watch the groundhog emerging from its burrow. In southeastern Pennsylvania, Groundhog Lodges (Grundsow Lodges) celebrate the holiday with fersommlinge, social events in which food is served, speeches are made, and one or more g’spiel (plays or skits) are performed for entertainment. The Pennsylvania German dialect is the only language spoken at the event, and those who speak English pay a penalty, usually in the form of a nickel, dime, or quarter per word spoken, with the money put into a bowl in the center of the table. The largest Groundhog Day celebration is held in Punxsutawney, Pennsylvania, with Punxsutawney Phil. Groundhog Day, already a widely recognized and popular tradition, received widespread attention as a result of the 1993 film Groundhog Day.